This rug is awesome, true to to pictures. Infuse some boho charm into your space with this beautiful Cayuga rug from The Curated Nomad. 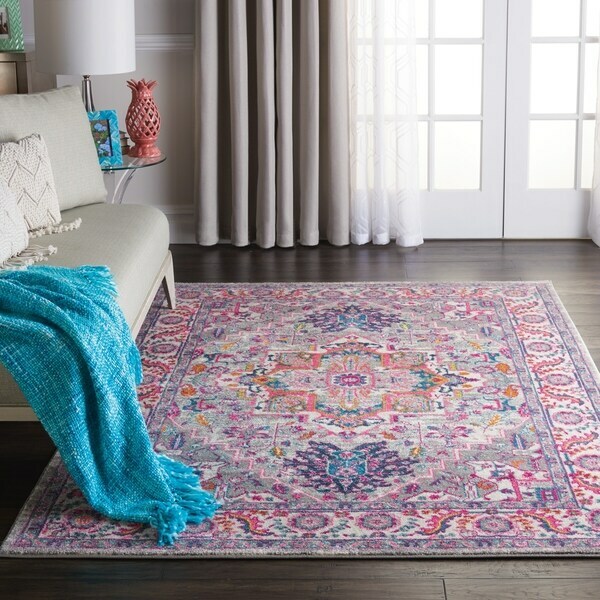 Available in a range of sizes in your choice of teal or pink as the main color, this rug features a gorgeous multicolor medallion pattern that enlivens any home. Dimensions 96.0 In. X 8.0 In. X 8.0 In. I love this rug!. The colors of the rug are true to the picture online. It arrived quickly and was packaged very well. No damage or kinks in the rug. Its exactly what I expected for this type of indoor rug. I would buy more of this brand in the future! The colors of the rug are vibrant and eye catching, but the rug itself appears to be very cheaply made (unpacked to find loose strings and backing chipping off). Not terrible for the price, but definitely not a quality item. I am keeping the rug at this time, but will be replacing in the near future. Beautiful rug. It is a little more flimsy then I thought but it’s still pretty and will work for in front of the kitchen sink... Definelty needs a rug pad underneath due to it being a thin rug. I love the rug. It has many bright colors that brightens the room. It compliments my new wood floor. The colors brighten the room. It is as described. It is soft, but not plush. I would recommend to a friend. Great price for this pretty rug. It's very feminine and would look great with any pink or grey decor items. Doesn't shed and is soft under my feet. Beautiful color looks great in guest bedroom.